Mostly sunny skies and chilly temperatures will remain across much of the Lone Star State Monday but a slight chance of rain is expected in the southern tip of Texas, according to the National Weather Service. The high will be in the upper 50s in the Dallas-Fort Worth area with south winds between 10 and 15 mph, though some gusts may be as high as 20 mph. Monday night temperatures should drop to around 37 degrees with calmer west winds. 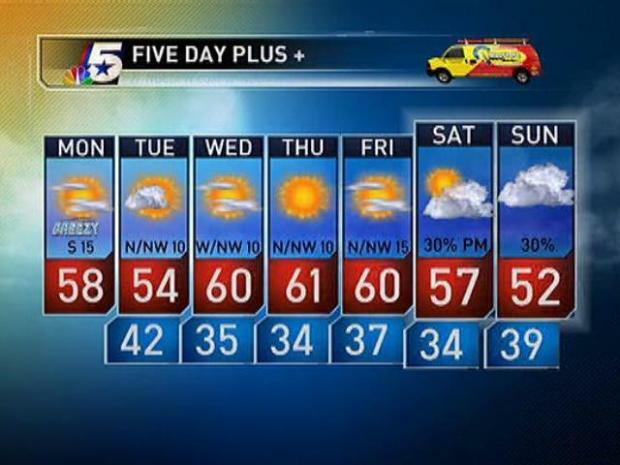 NBCDFW Meteorologist Jennifer Lopez updates the morning video forecast for Jan. 3, 2011. The high will only rise near 49 degrees under mostly sunny skies in the Amarillo area, although the wind chill factor will make it seem as cold as 9 degrees at times. The evening low will be around 18 with north-northwest winds between 5 and 10 mph. It will also be mostly sunny in El Paso, with a high near 53 degrees and a light, northeast wind dropping to a low around 30. Temperatures are expected to climb to near 62 in the Austin-San Antonio area under partly cloudy skies with a low in the upper 40s or lower 50s. A slight chance of rain may moisten the Rio Grande Valley. The chance of rain is 10 percent after noon in Brownsville, where it will be cloudy with a high near 68. After the sun sets the chance of rain jumps to 20 percent, with patchy fog after midnight and a low around 60.